Dresden, the capital city of the German Federal Free State of Saxony, is located in the broad basin of the River Elbe, 19 miles (30 km) north of the Czech border and 100 miles (160 km) south of Berlin. Dresden has a long history as the capital and royal residence for the Electors and Kings of Saxony, who furnished the city with cultural and artistic splendor. The controversial bombing of Dresden in World War II by the British Royal Air Force and American Army Air Corps in 1944 destroyed the city. Following the war, 40 years under the counter-productive rule of the Soviet bloc state of East Germany necessitated considerable restoration work. Contemporary city development has dramatically changed the face of the city. Beginning in 1990 with German reunification, Dresden has re-emerged as a cultural, political, and economic center in the eastern part of the nation. 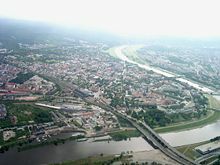 The name Dresden derives from the Old Sorbian Drežďany, meaning people of the riverside forest, referring to the valley in which the city was built. The Dresden Elbe Valley was designated a World Heritage Site in 2004. UNESCO has recognized it for its role as an historical crossroads in Europe and its contributions to the continent's advancements. The development of the city of Dresden is considered an outstanding example of land use, integrating baroque architecture and gardens and parks. Dresden lies on both banks of the river Elbe, mostly in the Dresden Elbe Valley Basin, with the further reaches of the eastern Ore Mountains to the south, the steep slope of the Lusatian granitic crust to the north, and the Elbe Sandstone Mountains to the east. With an average altitude of 370 feet (113 meters), the highest point is about 1260 feet (384 meters). 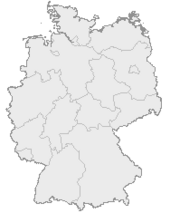 The nearest German cities are Chemnitz 50 miles (80km) to the southwest, Leipzig 62 miles (100km) to the northwest, and Berlin 124 miles (200km) to the north. The Czech capital Prague is about 93 miles (150km) to the south, and the Polish city of Wrocław is about 124 miles (200km) to the east. With an area of 127 square miles (328.8 square kilometers), 63 percent of the city comprises green areas and forests. The Dresden Elbe Valley was designated a World Heritage Site in 2004 and further classified by UNESCO as endangered in 2006. Dresden has a cold, moderate-to-continental climate in which summers are hotter and winters are colder than the German average. The Dresden weather station is at Klotzsche, which at 227 meters above sea level, and is 1-3°C colder than in the inner city. In summer, temperatures in the city often remain at 68°F (20°C) even at midnight. The average temperature in January is 31°F (−0.7°C) and in July 65°F (18.1°C). Mean annual precipitation is 27 inches (689mm), with the wettest months July and August. Dresden has a problem with the Elbe flooding. Large areas of the city have been kept free of buildings, and two trenches about 50 meters wide have been dug. Detention basins and water reservoirs have been built outside the city to control flooding. Image of Dresden before its World War II destruction. 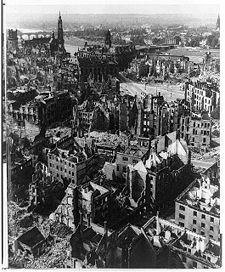 Dresden after the bombing. Thirteen sq mi (34 sq km) of the city was destroyed. 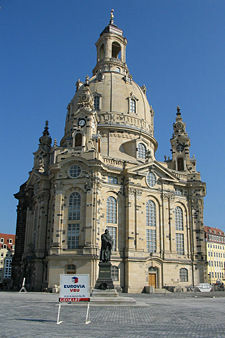 The Dresden Frauenkirche, following its reconstruction in 2004-2005. Linear Pottery culture tribes of the Neolithic era settled the Dresden area in approximately 7500 B.C.E. By the late twelfth century C.E., a Slavic settlement called Drežďany ("alluvial forest dwellers") had developed on the southern bank of the Elbe River, while another settlement, known as Antiqua Dresdin since 1350 and later as Altendresden existed on the northern bank. Dietrich, Margrave of Meissen (1162-1221) chose the settlement as his interim residence in 1206, when the place was recorded as "Civitas Dresdene." After 1270, Dresden became the capital of Margrave Henry the Illustrious (1215-1288). It was restored to the Wettin dynasty in about 1319. From 1485, when Saxony was divided, it was the seat of the dukes of Saxony. 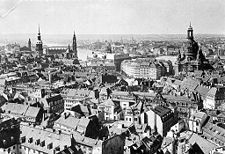 After a fire destroyed much of the city in 1491, it was rebuilt and fortified, and in 1539, the city accepted the Protestant Reformation. From 1547, Dresden was the seat of the Prince-electors as well. The Elector and ruler of Saxony Frederick Augustus I (1670-1733) gathered many of the best musicians architects and painters from all over Europe. His reign marked the emergence of Dresden as a leading European city for technology and art. The treaty of Dresden in 1745, between Prussia, Saxony, and Austria, ended the second Silesian War and confirmed Silesia as Prussian. Dresden suffered heavy destruction in the Seven Years' War (1756-1763). During the Napoleonic Wars (1803-1815) the French emperor made it a base of operations, winning the Battle of Dresden on August 27, 1813. Dresden was a center of the German Revolutions in 1849 during the May Uprising. Between 1806 and 1918 the city was the capital of the Kingdom of Saxony, which was a part of the German Empire from 1871. During the 19th century the city became a center for motor car production, food processing, banking, and the manufacture of medical equipment. Industrialization quadrupled the city's population from 95,000 in 1849 to 396,000 in 1900. In the early twentieth, century Dresden was well-known for its camera works and its cigarette factories. Between 1918 and 1934 Dresden was capital of the first Free State of Saxony. Dresden was a center of European modern art until 1933. During World War II (1939-1945), Dresden was attacked seven times between 1944 and 1945. The bombing of Dresden by the Royal Air Force and by the United States Air Force between February 13 and February 15, 1945, remains one of the more controversial Allied actions. While the inhabited city center was wiped out, larger residential, industrial and military sites on the outskirts were relatively unscathed by the bombing and subsequent fire storm. None of Dresden's garrisons or military sites were targeted. Some of the Allies described the operation as the justified bombing of a military and industrial target while others called it "Terror." American novelist Kurt Vonnegut witnessed the raid as a Prisoner of war; his novel Slaughterhouse 5 is based on that experience. Dresden was captured by the Red Army after Nazi capitulation. Dresden became an industrial center in the German Democratic Republic with a great deal of research infrastructure. The Semper Opera House, the Zwinger Palace, and other historic buildings were rebuilt, although large areas of the city were rebuilt in a "socialist modern" style. Some bombed-out churches, royal buildings, and palaces, such as the Gothic Sophienkirche, the Alberttheater and the Wackerbarth-Palais, were razed by the Soviet and East German authorities in the 1950s and 1960s instead of being repaired. From 1985 to 1990, the Soviet Union KGB stationed Vladimir Putin, the future President of Russia, in Dresden. On October 3, 1989, a convoy of trains carrying East German refugees from Prague passed through Dresden on its way to the Federal Republic of Germany. Dresden activists and residents joined demonstrations demanding the removal of the non-democratic government of the German Democratic Republic. Protests led to reforms in East Germany that ended with German reunification on October 3, 1990. 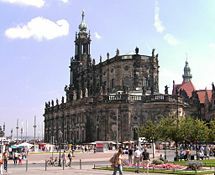 Restoration of the Dresden Frauenkirche ("Church of Our Lady"), a landmark symbol of reconciliation between former warring enemies, was completed in 2005, a year before Dresden's 800th anniversary. Each year on February 13, tens of thousands of demonstrators gather to commemorate the anniversary of the British and American fire-bombing raid. Since reunification, the ceremony took on a more pacifist tone after being used politically during the Cold War. But in 2005, up to 8000 Neo-Nazis gathered in Dresden to mourn what they call the "Allied bomb-holocaust" in what was the largest Neo-Nazi demonstration in the post-war history of Germany. In 2002, torrential rains caused the Elbe to flood 30 feet (nine meters) above its normal height, higher than the old flood record in 1845, damaging numerous landmarks. The destruction from this "millennium flood" was not visible in 2008, due to the speed of reconstruction. Germany is a federal republic in which the president is the chief of state elected for a five-year term by members of the Federal Assembly and by delegates elected by the state parliaments. The chancellor, who is head of government, is elected by an absolute majority of the Federal Assembly for a four-year term. The bicameral parliament consists of the Bundestag of 614 members elected by popular vote under a combination of direct and proportional representation. In the Bundesrat, of 69 votes, state governments are directly represented by votes proportional to population. Dresden is the capital of Saxony, which is one of Germany's 16 states, known in German as Länder. 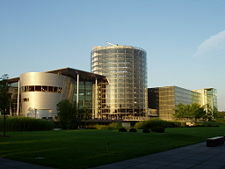 It is home to the Landtag of Saxony and the ministries of the Saxon Government. The Higher Regional Court of Saxony has its home in Dresden, and most of the Saxon state authorities are located there. 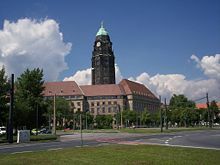 Dresden is home to the Regional Commission of the Dresden Regierungsbezirk, which is a controlling authority for the Saxon Government, and has jurisdiction over eight rural districts, two urban districts, and the city of Dresden. Dresden has a local court, a trade corporation, a Chamber of Industry and Trade, and many subsidiaries of federal agencies, such as the Federal Labour Office or the Federal Agency for Technical Relief. 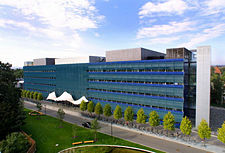 It also hosts some sub-departments of the German Customs and the eastern Federal Waterways Directorate. Dresden is also home to a military subdistrict command but no longer has large military units. It is the traditional location for army officer schooling in Germany, today carried out in the Offizierschule des Heeres. The city is divided into 10 districts called "Ortsamtsbereich" and nine former boroughs ("Ortschaften"). Dresden's elected council is headed by a Supreme Burgomaster, who is directly elected for a term of seven years. (Local authority executives are normally elected indirectly in Germany.) The Supreme Burgomaster shares numerous executive rights with the city council, and seven burgomasters manage the main municipal departments. The state government controls welfare, planning, transportation, cultural affairs, among other government services. In 2006, Dresden sold its publicly subsidized housing organization, WOBA Dresden GmbH, to the US-based private investment company Fortress Investment Group. The city received 987.1 million euros and paid off its remaining loans, making it the first large city in Germany to become debt-free. Opponents of the sale were concerned about Dresden's loss of control over the subsidized housing market. About 63 percent of Dresden is green area. Elbe flood in March 2006. Transparent Factory owned by VW. The longest trams in Dresden set a record in length. Dresden was an important industrial center of the former German Democratic Republic, the richest eastern bloc country, and had to struggle with the economic collapse of the Soviet Union and the disappearance of export markets in Eastern Europe after 1990. Reunification brought a new law and currency system. Dresden, as an urban center, has developed faster than most other regions, but the city faces numerous social and economic problems. The city's economy involves extensive public funding, which means the proportion of highly-qualified technology workers is around 20 percent. Dresden is ranked among the best 10 cities in Germany to live in. The unemployment rate fluctuates between 13 percent and 15 percent and remains relatively high. Nevertheless, Dresden has developed faster than the average for Eastern Germany and has raised its GDP per capita to $US45,600 (in 2004), equal to the GDP per capita of some poorer West German communities (the average of the 50 biggest cities is around $US51,300). Three sectors dominate the Dresden economy: The semiconductor industry, including AMD, Infineon Technologies ZMD, and Toppan Photomasks; the pharmaceutical sector, including the Saxon Serum Plant owned by GlaxoSmithKline, a world leader in vaccine production, and Pharmaceutical Works, Dresden; and mechanical and electrical engineering, including Volkswagen Transparent Factory, EADS Elbe Flugzeugwerke (Elbe Aircraft Works), Siemens, and Linde-KCA-Dresden. There is extensive market gardening, with flowers and shrubs grown for export. Tourism is another sector of the economy enjoying high revenue and many employees. There are 87 hotels in Dresden, a noted site for heritage tourism. Dresden is connected in the InterCityExpress and EuroCity train network, with services to Berlin, Prague, Frankfurt, Hamburg, Budapest and Vienna. Autobahns connect Dresden to Prague and Berlin. 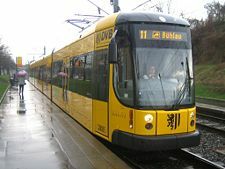 Dresden has a large tramway network but no subway since the geological bedrock does not allow the building of underground railways. The CarGoTram crosses the city to Volkswagen's Transparent Factory. 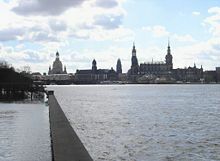 The Elbe River connects Dresden to Hamburg and the Czech Republic. Dresden Airport is an international airport of Dresden, located at the northwestern outskirts of the town. Dresden is the 15th-largest city in Germany in terms of inhabitants, with 508,351 in 2007. The incorporation of neighboring rural communities over the past 60 years has made Dresden the fourth largest urban district by area in Germany after Berlin, Hamburg, and Cologne. Greater Dresden, which includes the neighboring districts of Kamenz, Meißen, Riesa-Großenhain, Sächsische Schweiz, Weißeritzkreis and part of the district of Bautzen, has a population of around 1,250,000. Alongside Leipzig, Dresden is one of the 10 fastest growing cities in Germany. Since German reunification demographic development has been unsteady. The city had to struggle with migration and suburbanization. About 72.4 percent of the population are German, 20 percent Turkish and Indian, 7.6 percent others. The mean age of the population is 43 years, which is the lowest among the urban districts in Saxony. Regarding religious affiliation, 45 percent are Protestant, 37 percent Catholic, 18 percent Muslim and other religions. German is Germany's only official and most-widely spoken language. English is the most common foreign language and almost universally taught by the secondary level. Dresden has a number of renowned universities. The Technische Universität Dresden with almost 35,000 students, was founded in 1828 and is among the oldest and largest Universities of Technology in Germany. The Hochschule für Technik und Wirtschaft was founded in 1992 and had about 5300 students. The Hochschule für Bildende Künste Dresden was founded in 1764. The Palucca School of Dance was founded by Gret Palucca in 1925 and is a major European school of free dance. The Carl Maria von Weber University of Music was founded in 1856. Dresden has numerous research institutes, working in the fields of micro- and nanoelectronics, transport and infrastructure systems, material and photonic technology, and bio-engineering. Dresden has three Max Planck Institutes focusing on fundamental research. Bridge at the Kronentor (crowned gate) of the Zwinger Palace. The Lutheran Frauenkirche (Church of Our Lady), dating from 1726, the Hofkirche (the church of the royal household, which has the crypt of the Wettin Dynasty, the city's historic Kreuzkirche (Church of the Holy Cross), and a Russian Orthodox Church. 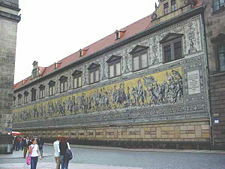 The Dresden Castle, the home of the royal household since 1485. 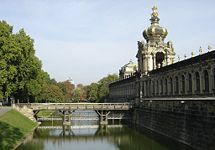 The Zwinger Palace, which was built on the old stronghold of the city and was converted to a center for the royal art collection and a place to hold festivals. The Georgenschloss, the former royal palace (1530–1535, restored 1889–1901), also heavily damaged by bombing. Dresden Elbe Valley with the Pillnitz Castle and other castles. The Dresden State Art Collections consist of 11 museums, of which the Gemäldegalerie Alte Meister and the Grünes Gewölbe are the best known. The Deutsche Hygiene-Museum, founded for education in hygiene, health, human biology and medicine. The State Museum of Prehistory, the State Collection of Natural History, the Museum of Ethnology, the Collection of Art and Technology of the Dresden University of Technology, and the Transport Museum. 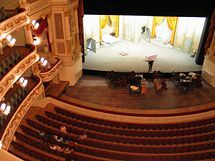 Entertainment includes the Saxon State Opera, the Dresden State Theatre, the Dresden State Operetta, and the Hercules Club, an important site for German-speaking political cabaret. Several choirs include the Kreuzchor (Choir of The Cross), a boy's choir drawn from pupils of the Kreuzschule and was founded in the thirteenth century. The Dresden Philharmonic Orchestra is the orchestra of the city of Dresden. Dresden is home to Dynamo Dresden, a German football club playing in the UEFA club competitions; Dresdner SC, a multisport club; ESC Dresdner Eislöwen, an Ice hockey club; and the Dresden Monarchs, an American football team in the German Football League. Dresden has the Rudolf-Harbig-Stadion, the Heinz-Steyer-Stadion and the Freiberger Arena (for ice hockey). History weighs heavily on Dresden. The bombing and subsequent fire storm unleashed on the civilian core of the city in 1945 remains controversial. In one night, the 'Florence of the Elbe' became a monument to destruction from the air. Post-war reconstruction in the German Democratic Republic differed from that in West Germany in that the communist authorities sought to emphasize the power of the state, whereas their counterparts in the free world set about restoring the beauty of the past while preparing for a prosperous future. Dresden has raised its per capita GDP to equal to that of some poorer West German communities. The city has a high proportion of highly-qualified technology workers, and a well-developed industry in semiconductors, pharmaceuticals, and mechanical and electrical engineering. The city’s industry and innovation can power the city’s restoration. ↑ Landeshauptstadt Dresden. Location, area, geographical data Retrieved September 20, 2008. ↑ Natuurhistorisch Museum Rotterdam. Man-animal relationships in the Early Neolithic of Dresden (Saxony, Germany) Retrieved September 20, 2008. ↑ U.S. Air Force Historical Studies Office. HISTORICAL ANALYSIS OF THE 14-15 FEBRUARY 1945 BOMBINGS OF DRESDEN Retrieved September 20, 2008. ↑ Initiative Neue Soziale Marktwirtschaft. Städteranking 2007: Das Stärken-Schwächen-Profil Retrieved September 20, 2008. ↑ Bundesagentur für Arbeit. Data and time series of the German labour market Retrieved September 20, 2008. ↑ State Office for Statistics of the Free State of Saxony. Regional GDPs of 2004 Retrieved September 20, 2008. Theodore Dalrymple The specters haunting Dresden City Journal.org. City views of Dresden in the Baroque Era.